The Empire Strikes Back (also known as Star Wars: Episode V – The Empire Strikes Back) is a 1980 American epic space-opera film directed by Irvin Kershner. 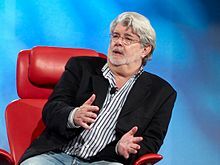 Leigh Brackett and Lawrence Kasdan wrote the screenplay, with George Lucas writing the film's story and serving as executive producer. The second installment in the original Star Wars trilogy, it was produced by Gary Kurtz for Lucasfilm and stars Mark Hamill, Harrison Ford, Carrie Fisher, Billy Dee Williams, Anthony Daniels, David Prowse, Kenny Baker, Peter Mayhew, and Frank Oz. Three years after the destruction of the Death Star, the Rebel Alliance, led by Princess Leia, has set up a new base on the ice planet of Hoth. The Imperial fleet, led by Darth Vader, continues to hunt for the new Rebel base by dispatching probe droids across the galaxy. Luke Skywalker is captured by a wampa while investigating one such probe, but manages to escape from the wampa's lair with his lightsaber. Before Luke succumbs to hypothermic sleep, the Force ghost of his late mentor, Obi-Wan Kenobi, instructs him to go to Dagobah to train under Jedi Master Yoda. Han Solo locates Luke and cuts open the tauntaun he rode there on to keep his friend warm; they wait there until being rescued by a search party the next morning. Meanwhile, the probe alerts the Imperial fleet to the Rebels' location. The Empire launches a large-scale attack using AT-AT walkers to capture the base, which forces the Rebels to retreat. Han and Leia escape with C-3PO and Chewbacca on the Millennium Falcon, but the ship's hyperdrive malfunctions. They hide in an asteroid field, where Han and Leia grow closer amidst tension and briefly kiss. Vader summons bounty hunters to assist in finding the Falcon. Luke, meanwhile, escapes with R2-D2 in his X-wing fighter and crash-lands on the swamp planet of Dagobah. He meets a diminutive creature who reveals himself to be Yoda; after conferring with Obi-Wan's spirit, Yoda reluctantly accepts Luke as his student. Intending to hold Luke in suspended animation by imprisoning him in carbonite, Vader selects Han to be frozen as a test subject. Han survives the process and is given to Fett, who plans to collect the bounty on him from Jabba the Hutt. Lando frees Leia and Chewbacca, but they are too late to stop Fett from departing with Solo aboard. They fight their way back to the Falcon and flee the city. Meanwhile, Luke arrives and engages Vader in a lightsaber duel that leads them over the city's central air shaft. Vader severs Luke's right hand, disarming him, and tempts him to join forces. Luke accuses Vader of murdering his father, but Vader reveals that he is Luke's father. Horrified, Luke drops into the air shaft and is ejected beneath the floating city, where he hangs on an antenna. He reaches out telepathically to Leia, who senses him and persuades Lando and Chewie to turn back. After Luke is brought aboard, they are chased by TIE fighters towards Vader on his Star Destroyer, but R2-D2 reactivates the Falcon's hyperdrive, allowing them to escape. Rejoined with the Rebel fleet, Luke's severed hand is replaced with a robotic hand. Lando and Chewbacca depart in the Falcon with hopes of saving Han.